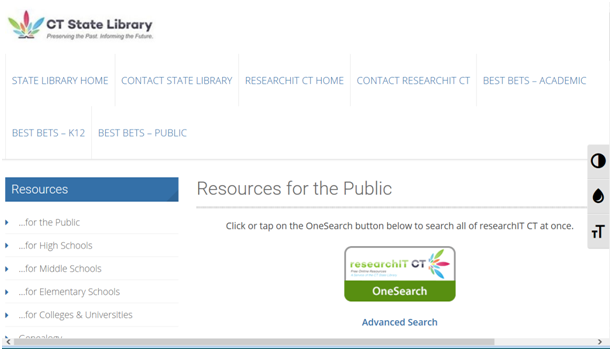 The questions and answers on this page will help you use the "OneSearch" feature in researchIT CT. The "iCONN OneSearch" feature allows you to search thousands of full text articles. For a general introduction, try the iCONN OneSearch Video Tutorial below. What is searched in OneSearch? What is the difference between OneSearch and EBSCOhost? After doing a search, how do I return to my starting point? How can I determine if researchIT CT has a particular magazine title? How do the resources provided by EBSCO correspond with the resources I am familiar with that were provided by Cengage Gale? The "Search Options" and "Advanced Search" screens allow the user to limit searches by "Lexile Reading Level" or "Lexile Reading Score" for certain databases. What do these limiters mean? What is the purpose of the Integrated Search links and how do they work? How do I obtain an audiobook after receiving the search results? Do you offer Consumer Reports? Where can I find more information about how to use these databases? Why do I have to log in to search researchIT CT? All search results are full-text and listed in order of relevance to the search request. Statewide Library Catalog - searched using findIT CT.
OneSearch is the simplest and most comprehensive search facility that researchIT CT offers, as described above in "What is searched in OneSearch?" EBSCOhost, on the other hand, provides a much richer, advanced search facility to enable very precise searches but the scope of its search is limited to searching just EBSCO databases (see EBSCO Resources in researchIT CT/EBSCOhost by Audience below). Although the advanced search facility of OneSearch is more limited, its search results page provides many ways to further refine the search results. Here is a tutorial on EBSCOhost's advanced search facility: http://support.ebsco.com/training/flash_videos/adv_guided/adv_guided.html. To do a new search, click on "New Search" in the top menu bar [see figure 1 below], or hit your browser's Back button. 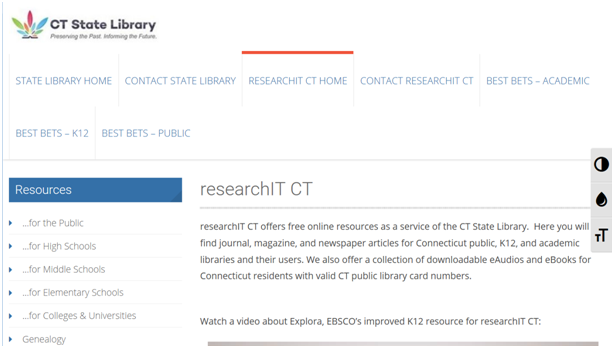 To return to the researchIT CT landing page [see figure 2 below], click on "To researchITCT.org" in the top menu bar, or the researchIT CT logo near the upper left hand corner of the window [see figure 1 below]. To return to the researchIT CT resources page [see figure 3 below], click on "Select researchIT CT Resource" in the top menu bar [see figure 1 below]. Although there is not an exact one-to-one correspondence between the new and previous resources, we prepared a cross-reference guide (in Excel format) to help situate the new resources. The “Search Options” and “Advanced Search” screens allow the user to limit searches by “Lexile Reading Level” or “Lexile Reading Score” for certain databases. What do these limiters mean? Lexile levels or scores are based on a rating system – called the Lexile Framework for Reading, developed by MetaMetrics, Inc. - designed to measure the reading difficulty of the content based on word frequency and sentence length. The scores range from 200 (easiest to read) to 1300+ (the most complex). When limiting a search by a specific Lexile Reading Score rather than a range, the system will display results which have a Lexile Reading Score of -100 to +50 outside the score you specify. More detailed information about how EBSCO uses Lexile scores in its databases can be found here. References to analysis of text complexity can also be found in Common Core State Standards For English Language Arts & Literacy In History/Social Studies, Science, And Technical Subjects. Clicking on any of these links will display the search results for just that resource. If you check any of the checkboxes next to the links, and then click the Update button, the search results for the resources you checked will be integrated with the search results for OneSearch. You should be aware that the “Limit to Peer Reviewed” limiter in the left column of the search results screen will not produce search results in the Integrated Search links because these links do not support this limiter function. There is a direct link to the Popular Magazines page listed above from each audience-specific landing page (see Figure 2 above) and each audience-specific classic menu page (see Figure 3 above). Your browser is the software that you use to access the Internet and the most common browsers include Internet Explorer, Firefox, and Chrome. If a feature in researchIT CT isn't working, you can reivew the Browser Support and Configuration guide. We also encourage you to discuss your information needs with your public, school or college librarian who can help you get the most out of these databases. Contact information for all public libraries in CT is here. researchIT CT’s license agreements with vendors require us to verify that only authorized users can access the resources. The log-in procedure ensures adherence to our license agreements. License agreements typically base their costs on the number of potential users. If there were no login procedure, access would be completely open and the cost to Connecticut would be astronomical.